This planting is in the Rock Wall garden . Rose 'New Dawn' normally tends to reach to a mature height of 5.00 metres [imperial: 16.25 feet] so ensure you have enough space in your garden for this plant. Your garden has full sun light - a partial sun position will ensure your plant thrives. Your garden has silt loam soil: planting in loam soil will ensure your plant thrives. 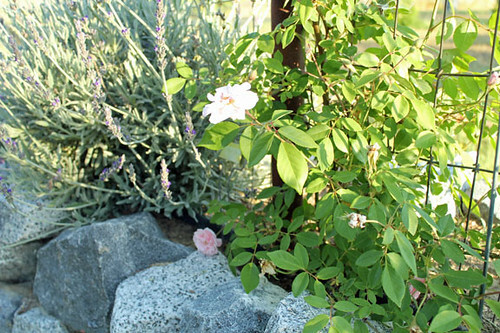 Your garden's USDA Hardiness Zone (9) is within the ideal range for Rose 'New Dawn'. The recommended range is between Zone 5 and 9. Try to keep the ph of your soil between the range of 4.5 and 8.0 as Rose 'New Dawn' likes to be in acidic to alkaline soil. More information about Rose-New Dawn is available in the Folia gardener's wiki. All Rose-New Dawn Care Instructions have been kindly provided by our members. some longer canes this year, Yay!